Follow the green arrows in this instructional. NOTE: For Netflix settings the following steps must be done for each "profile" on the account. After you are signed into Netflix, click your name at the top right and then select “your account”. Under “My Profile”, select “Playback Settings”. We recommend the Low/basic setting for optimal streaming. Auto is not recommended as Netflix will continue to try to use all available bandwidth and may buffer more often. Save and enjoy your show! While streaming a video, you can access a hidden menu by pressing Shift+Alt+Left Click (Shift+Option+Click on a Mac). Under "Stream Manager" you can manually adjust the bandwidth usage. If you're having trouble with constant buffering, you can adjust it. There is also an option to adjust audio/video sync in the rare event that dialogue isn't lining up with the actors. With Hulu (and many other services/video players) the quality adjustment is in the player itself. Usually it appears as a gear, or some sort of tool. Here you can adjust your quality – we recommend the Low/basic setting for optimal streaming. If your Internet connection is slow or High Definition movies or TV shows take longer than normal to start, try changing your Video Resolution to Standard Definition. From the main iTunes menu, choose Settings > iTunes Store and switch 1080p HD or 720p HD to Standard Definition. Your Movie and TV show purchases and rentals will now be in Standard Definition. 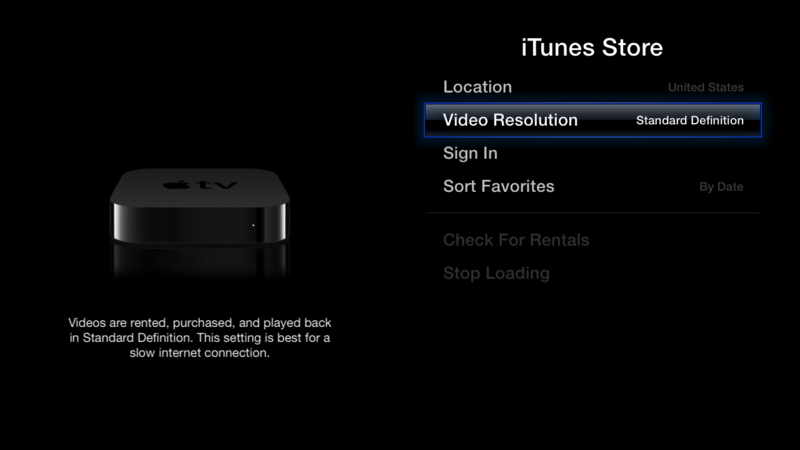 Note: 1080p HD content is available on Apple TV (3rd generation) only. It's always a good idea to update your software. Software updates can include feature changes and fixes that might enhance your viewing experience. How do I get to Settings on classic Roku players? From Roku home screen, select “settings.” You can use settings to change your network configuration, your display type, audio mode and sound effects. You can also turn on/off a screensaver, change Netflix settings and update your Roku software. If you wish to set the speed of your connection for video streaming manually on the Roku video player, there is a code you can enter to access the speed override settings. From the Home screen, press the Home button 5 times, the Rewind button 3 times, and the Fast Forward button 2 times. A screen will appear where you can set the speed you desire. Navigate to: Preferences -> Data Monitoring -> (This is set to 'Best' by default for HD video streaming and will use all of the bandwidth that it can). Set this option to 'Good' or 'Better' for far less buffering at a slight quality trade off. Royell Communications, Inc. does not endorse and is not associated with Amazon, Hulu, Netflix, Apple or Roku. The screenshots provided are taken of each company's website for instructional and informational use only. The information provided here was gathered from searching the Internet and from first hand experience with each service/device.